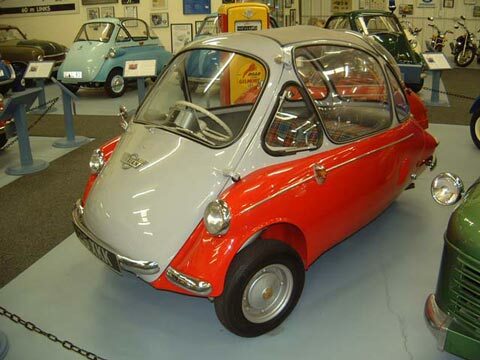 Professor Heinkels "better Isetta" was indeed lighter and faster with a smaller engine. The ability to carry four people stood it in good stead despite the fixed steering column. 1957 was a banner year for the Heinkel, with 7000 examples leaving the works. However, early 1958 brought a noticeable downturn in interest in the Heinkel Kabine. Most significantly, permission was received to once more resume the production of aircraft, which was, of course the original orientation of the company. Suddenly, the Kabine was no longer viable, and a licensee to take over production had to be found. 2000 examples were built in Argentina from 1957 to 1959. In 1958, a concern in Ireland produced 200 examples of the Kabine (known as the Heinkel-I) before having their license revoked for shoddy workmanship. In the fall of 1960, the license was duly given to Trojan, a long-established firm (1928) producing a long line of rugged, simple utility vehicles. Type 601 (3-wheel right hand drive). as well as an Estate van. Later Trojans had Wipac lamps and fixed plastic quarter windows. In production until 1966, it was the longest surviving true bubblecar, whereupon Trojan turned to the production of the fiberglass-bodied Elva sportscar. Weight: 245 kg Electrics: 12 v 3 Wheels: 4.40 x 10"